It’s the 1st of October and a Monday so of course that means it’s my day for sharing my Monday Design Team make for Visible Image. Today I am sharing for the first time a card I made using the brilliant One Kind Word set. Now don’t tell anyone, but this is my favourite. I have honestly been looking for a vintage typewriter stamp where I could actually stamp words on the paper for years. Well now I can. It is such a clever set and I am sure is going to be a best seller. It works for so many occasions and for card making, journalling etc etc. I had a lovely Friday and Saturday creating in my garden studio. There was wall to wall blue skies and sunshine and I loved being outside. I have noticed the signs of autumn though all around me. We are starting a new challenge today over on our Visible Image Facebook group. The theme is “Autumn Colours”. So dig out your brown, yellow, orange, gold, mauve, red and other autumnal colours and your Visible Image stamps/stencils. We would love for your to join in! The winner is randomly selected so whether you are a novice or experienced stamper you have a chance of winning the £40 voucher to spend over in the shop. My card was made in shades of browns to hopefully give some inspiration for our new “autumn colours” challenge, I also wanted to create a vintage feel to it. 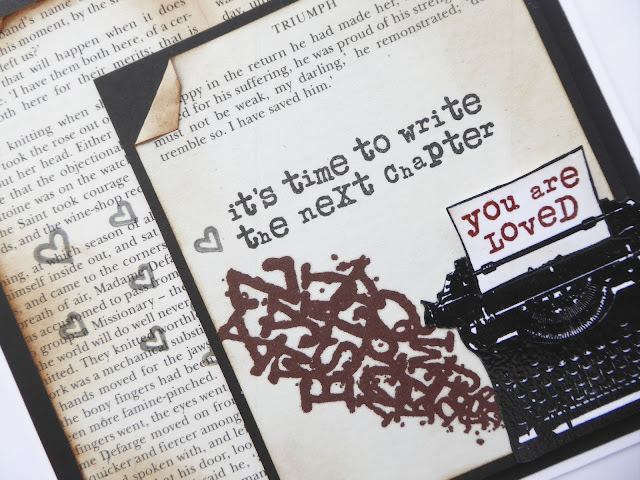 I was very taken by one of the 2 sentiments in this set “time to write a new chapter” and I had a light bulb moment when I was sitting in my studio. I had decided to include my much used vintage book pages from “A tale of 2 cities” donated by my Hb. As I was thinking of how I would use them in my design I thought that I could actually find a page that was the end of a chapter, ready to start a new one. 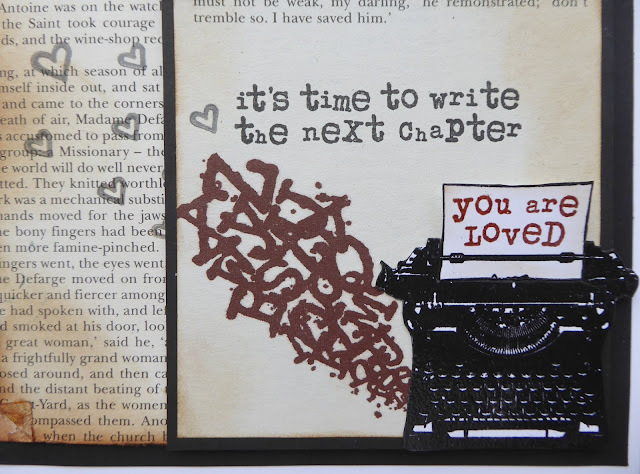 I found a suitable page and stamped the sentiment and the letters flourish in brown ink. 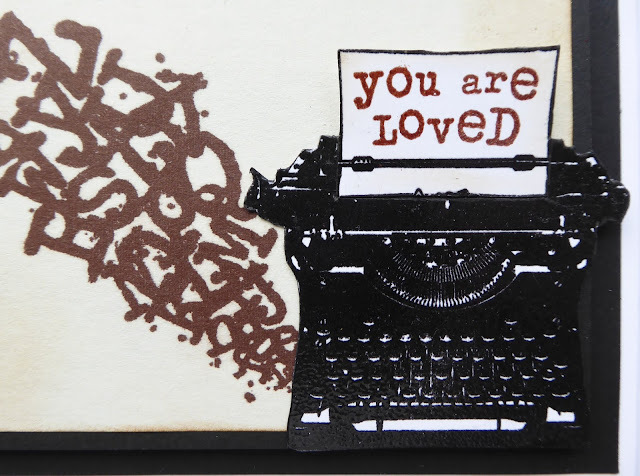 I also cut out the paper part and stamped the words, “You are loved” in brown ink. I put some foam under the top of this and glued down the base to add some dimension. I made a “book” with my vintage book pages and aged them using vintage photo distress ink plus a little tearing and peeling here and there. 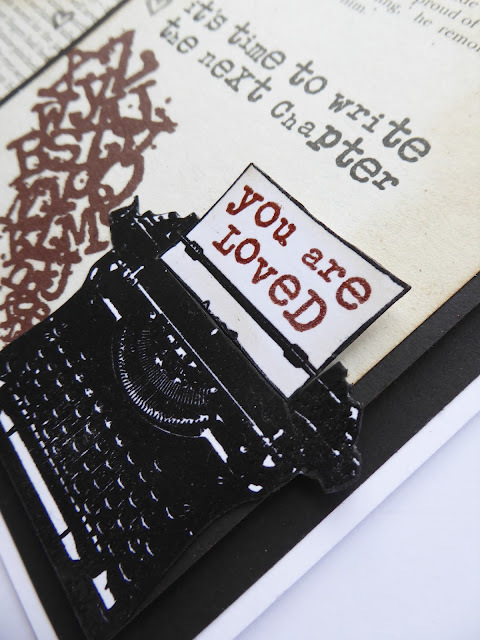 I stamped,embossed and fussy cut out my typewriter and stamped the small and large hearts and matted up my card. With a couple of close ups.. Thanks so much for stopping by today and have a very happy October, the year is just racing by now. You can pre-order our fantastic new stamps and stencils HERE! We will be back tomorrow with more gorgeous inspiration! This entry was posted in Cards for men, inspiring quote stamps, Masculine Projects, Our NEW stamps, Sentiment stamps, Typewriter Stamp. Bookmark the permalink.